Footballers have long relied on the terraces for inspiration but when Olivier Tebily does so these days, he is looking at rows of vines - not fans. While many footballers' post-playing plans involve staying in the game, the former Ivory Coast international has eschewed that to quietly focus on his second passion. Footballers and alcohol have long gone together, often badly, but the former Birmingham City defender is unique in actually creating the product. What's more, the treble winner with Celtic is doing so in Cognac, home to some of France's - and the world's - most celebrated vineyards. For similar to champagne, only the brandy made in the region can bear the prestigious name Cognac. As for whether the 41-year-old is just another footballer flashing his cash on a pet project, consider this - he bought his first vineyard in his late teens. "When I signed my first professional contract, I bought two hectares," Tebily told the BBC, standing amidst his vines in the south-western French village of Salles-d'Angles. "I said to myself: 'If I get an injury and football stops, I will have something to carry on with.'" "I did that because I used to work on this land to get a little bit of pocket money to go on holiday - to the seaside with my friends - before turning professional." "It's really difficult to become a professional so I bought this straight away to insure myself." It was 1993 when Tebily signed for second-tier French side Niort, an hour's drive from Poitiers, the south-western city on the edge of the Cognac region where his parents relocated from Abidjan when he was a toddler. It was the start of a journey that took him, following brief spells with Chateauroux and Sheffield United, to the 2000 Africa Cup of Nations, a Scottish treble in 2001 and a four-year Premier League adventure with Birmingham. After suffering a bad injury just weeks after joining Canada's Toronto FC, Tebily cut short a four-and-a-half-year contract to return to the vineyards. There was however a fundamental problem. Land in Cognac is both expensive and seldom available - and Tebily didn't have enough of it. He ran two local restaurants while waiting for a solution, which was laced with tragedy when it came six years later. After his neighbour's only son died, the retiring Cognac farmer had to decide who to sell his business to last year. "His son was my friend and we had the same name - it's maybe because of that that he chose me," says Tebily. "Around here, all the winemakers are the same," explains the now-retired Jean-Michel Lepine. "Because I liked football and because Olivier was not unpleasant to me and helped me in tough times - because I've had tough times - I said why not a black man to take over my property? Why not a footballer? "I never changed my mind, even though many people tried to stop me." Following the deal, the first African maker of Cognac - who says he was initially treated like "a Martian" - was the proud owner of 22 hectares in a prime location. He also took control of a distillery and although he has yet to master this crucial element of the Cognac process, he is learning from Jean-Michel, now his mentor. When we meet, Tebily is in his vineyard - wearing a Birmingham City fleece as he goes about his daily business, secateurs in hand, carefully tending to his grapes. Such sensitivity may seem incongruous for those who remember the burly defender's on-field reputation. He once finished a match despite rupturing knee ligaments in the first half while he famously thundered into one challenge with an opponent despite having lost a boot seconds earlier. "The local people were really, really surprised by an African footballer trying to do what they are doing," says Tebily, who played for Ivory Coast between 1999-2004. "But I work Monday to Sunday and people are really surprised - they didn't think I would do this work because it's really hard. "But I don't do this to impress people. I love this work and want to go as far as I can," he adds, proclaiming a love of the outdoors. 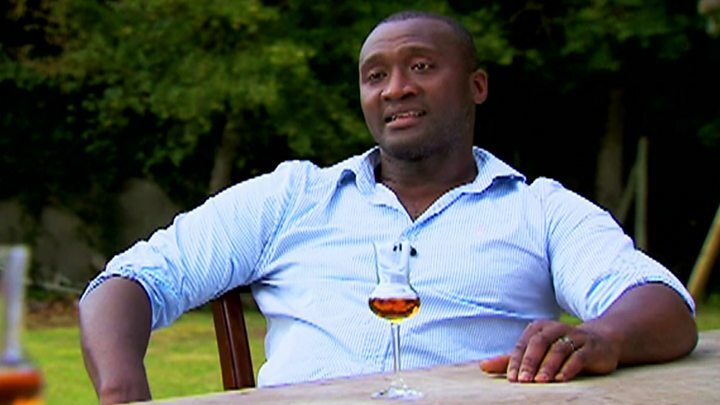 Like many Cognac farmers, Tebily sells most of his produce - around 90% - to the region's bigger companies but he keeps the rest for his own eponymous range. He first produced a bottle in 2013 - smooth upon taste - and although he sells it to local restaurants, he ultimately wants to trade only with Africa. "That's my dream," he says. "I am already selling to some restaurants in Africa, in Ivory Coast. It's not as much as I want but I'm still happy because it's the beginning and it's working." After that, and much in the tradition of many of the Cognac farmers, he hopes to hand his business down to his children when he takes a second retirement. Until then, this gentle giant is revelling in being the only African maker of the world's most famous brandy. "It makes me feel really, really happy and that's why I am fighting to do my business correctly. I try because I am passionate. I love this like I loved football."